Increasingly organisations are recognising the need of a digital strategy, but few know what they should include or how they are created. This post was originally written for Smashing Magazine and has been re-posted here with their kind permission. Can you put together a digital strategy for us to review” – Requests like this strike fear into those of us who work on the web. What do we know about putting together strategy documents? Yes we understand the web, but we don’t know how to write a document that is essentially a business strategy. What even goes into a digital strategy! Unfortunately, increasingly this is something management is requesting from web designers. Whether you are an external contractor or part of an in-house team, sooner or later you will be asked to put together a digital strategy. But do not despair. A digital strategy is not as intimidating as it sounds. It is just a document outlining how your company or client should handle the different aspects of digital from the website and mobile to email, social media and digital marketing. It doesn’t need to cover everything in huge depth (it would be unreadable if it did), but instead establish some general approaches to these different areas. This post will provide you with a crash course on where to start and what kinds of things to include. I hope it proves useful. Whether you have been asked to produce a digital strategy or management have reluctantly listened to your pleas to be more strategic, getting to write a digital strategy is an amazing opportunity. It is a chance to show your client or boss that you are more than an implementor and that you have a valuable contribution to make toward the future of digital. Creating a digital strategy is a chance to bring some order to the chaos that is most organisations approach to digital. It is a chance to bring some order to the chaos that is most organisations approach to digital. Most companies approach the web at a tactical level, making decisions on the fly in response to the latest new technology or business demand. If like me you have worked on projects where the requirements have changed part way through or somebody in senior management has suddenly decided the company needs an iPhone app, then you know quite how reactionary most organisations are. There is little long term thinking in terms of development roadmap, governance, resourcing and policies. By forming a digital strategy you have an opportunity to establish a firm direction for your online footprint, rather than being the victim of managerial whims. You may be tempted to look at business strategy documents for inspiration. After all, these have been around for years and their format is well established. However, as is so often the case when looking to other mediums for inspiration, they don’t really fit digital. A traditional business strategy focuses on two key components; a long term roadmap and budget forecasting. Unfortunately, both of these elements are hard to replicate in a digital strategy. Creating a digital strategy that looks 3–5 years ahead is an unrealistic expectation. Technology just moves too fast for that. Equally, accurate budgeting is difficult when the landscape is evolving at such a rapid rate. A digital strategy, therefore, has to take a different approach. A digital strategy needs to focus more on creating policies, priorities and people. A digital strategy needs to focus more on creating policies, priorities and people who can be trusted to make the right decisions as new technologies emerge, rather than defining everything up front. As the old adage says, it’s about “teaching a man to fish”. What does it mean for your digital strategy to focus on policies, priorities and people? Essentially, if the intention is to create a strategy that can adapt to the fast moving pace of digital, you need a flexible decision-making process. This requires the right people making those decisions within the right kind of framework and then being able to implement those decisions quickly. Who makes decisions about different digital elements and who actually does the work? This is the kind of thing that could be addressed using a responsibility assignment matrix. It is important that the right people are making the right decisions. For example, you don’t want the Head of IT making decisions on design or the Head of Marketing picking a hosting environment. This happens all too often when the digital strategy is managed by a committee. Adequately resourcing the digital strategy is also important. What work is going to be done in-house and what should be outsourced? When outsourcing what criteria are used for selecting a supplier? To enable fast decision making it helps to have a number of policies in place. Policies act as a framework within which operational decisions are made. In other words, instead of having to make a decision each time a scenario occurs, the decision has already been made and formalised into a policy. A great example of this is a social media policy. What are staff allowed to say on social media? What is acceptable and unacceptable? Having a social media policy provides security for staff (they know what they are allowed to do), but also prevents the need to discuss every tweet before it is posted. Policies are also great for resolving internal conflict. For example, having a policy for deciding what content appears on the site homepage can save a lot of conflict later. It moves the debate away from being subjective opinion to something more tangible. 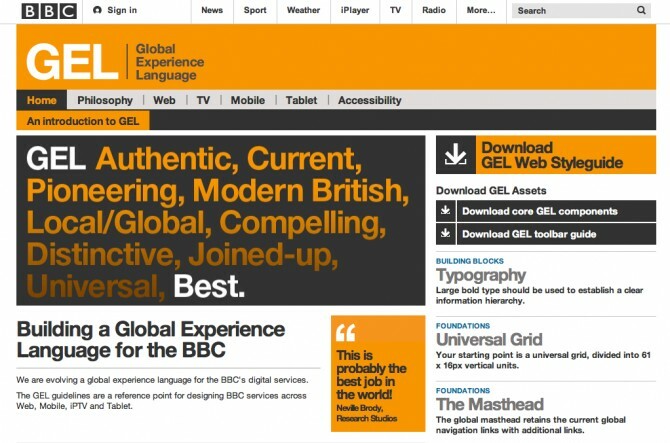 The BBC have clear policies for the design style of their websites. These policies do not all need to be defined in the digital strategy, but they need to be identified and an approach for their creation established. Overtime as each policy is put in place it needs to be agreed, documented and explained to stakeholders. The Government Digital Service does an excellent job at doing this in their service manual. Disagreement over priority is probably the primary factor that slows down decision making over digital within most organisations. In an environment where fast decision making is crucial, outlining key priorities is so important. The two most important priorities to set are business objectives and target audiences. Most organisations seem terrible at even defining their digital business objectives and user groups, let alone prioritising them. It is therefore essential that any digital strategy you write does exactly that. Without clearly defined priorities in these two areas you will have to argue about priorities every time they clash. Whether it be over homepage content or top level navigation, there will be numerous occasions where a clear list of priorities will help resolve conflicts and keep things moving forward. Where having a set of priorities becomes most useful is in the area of maintenance. If you are fed up with management pulling you from one ‘urgent’ set of tasks to another, you need a clear set of objectives. These prioritised objectives can help define whether or not something is truly urgent. Those who come with a ‘top priority’ request have to justify it against your agreed priorities. In the past I have worked with clients who have a prioritised stack of features and content that their in-house team work through. When somebody wants to add a new feature to the stack, they must sell the feature to a web committee based on user needs or business objectives. This then decides its place in the stack. Clear priorities about your audiences and objectives will also allow you to create a preliminary roadmap. Although creating the kind of roadmap you would see in a traditional business strategy document is unrealistic, that does not mean you cannot give at least some indication of a development program. The emphasis of your digital strategy should be on immediate issues that need addressing. What are the most urgent areas where work needs to be done? Because these are to be actioned immediately it is possible to provide a considerable amount of detail about how these can be tackled. When looking further ahead the level of detail can be reduced. It may be possible to give a rough timeline of development priorities as far as two years ahead, but it must be made clear that this roadmap would be subject to change as the digital landscape alters. To not include any kind of roadmap would prove unsatisfactory to most senior managers. They lack confidence in digital because they don’t really understand it and so need a roadmap to reassure them. Senior management lack confidence in digital because they don’t really understand it. They need a roadmap to reassure them. For them a digital strategy is about quantifying the web and giving them a sense of control over it. If all your digital strategy does is essentially say “trust your web team and their policies” this will not meet their need for control. A roadmap on the other hand (no matter how vague) will help give them the confidence they need. But what areas should that roadmap encompass? The exact scope of your digital strategy will vary depending on the organisation and what they do. That said, your digital strategy should encompass a lot more than the website. As web designers, it is easy for us to focus on the website, because that is what we know. However, digital is further reaching than that. Mobile – Are you going to build a responsive site? Do you need native apps? If so, what platforms will you support? Social Media – What platforms are you going to support? How are you intending to use social media? Who is responsible for it? What policies exist around acceptable behaviour? How are negative events handled? Email – This should cover everything from newsletters to trigger based emails. You should address who is responsible for email correspondence and how your email lists are maintained and privacy is protected. Digital Marketing – This would encompass everything from SEO and PPC to banner advertising and affiliate schemes. Website – What features should you support on the website? How do you decide on content? Who is responsible for site maintenance from design, content and technical perspectives? In each area the digital strategy should look at the benefits these technologies have for your business, assess its current performance and make recommendations over the short and long term. This scope can prove challenging for any one individual to address as it requires such a broad knowledge. If that is the case it may be that your digital strategy will have to recommend getting in experts to provide more detail in certain areas. It is better to be upfront with your limitations than leaving the strategy vague. With so many competing areas fighting for attention and only limited resources available, it is hard to write a digital strategy without looking at budget. Although it is impossible to define your digital strategy accurately enough to create detailed budgets, that does not mean you can avoid the subject of money. Senior management will need some indication of the budget in order to plan expenditure going forward. A good place to start is by shifting managements thinking away from a series of fixed cost projects to a program of ongoing development. A program of ongoing development is much better suited to the evolving nature of the web. A common approach to this kind of ongoing development is to adopt an agile model (such as used by GOV.UK). This uses a continually evolving stack of prioritised features and content that needs developing. As elements from the stack are developed, new elements are added in a continual cycle. This approach recognises your website and other digital assets are never finished and so it makes no sense to apply a fix price budget to them. Instead, expenditure on digital should be thought of as an annual, ongoing budget like you would spend on marketing. By shifting to an annual ongoing budget rather than a series of one off projects, budgeting becomes much easier. If the company wants to manage digital in-house then it is a matter of establishing approximate costs for an internal web team. Looking at the proposed work levels will give you an approximate idea of how big the team will need to be and who to include. This, in turn, will allow you to establish costs once you include salary, equipment and training. If the company needs to outsource some or all of their digital work then things become a bit more tricky. Ideally, some form of the retainer at an agreed level will probably work best. However, most organisations don’t like working with external contractors in this way. In that case, it is a matter of quoting on some of the work scheduled in the roadmap and extrapolating this over the year. This may all be sounding a little vague and that is because it is. As I implied at the beginning budgeting digital work is notoriously difficult. However, it cannot be entirely ignored. The best guess, with a suitable amount of contingency added, is better than nothing. At the very least it will start a discussion with senior management about the level of investment they can maintain. All of this talk about budgeting, policies and strategy may sound intimidating, but the truth is there is nobody better suited to put together a digital strategy. The truth is that there is probably nobody within your organisation or that of your clients who knows digital better than you. It’s also important to emphasise that you don’t need to produce these documents in isolation. Putting together a digital strategy should be done in close collaboration with all stakeholders and so you will not be working alone. The problem is that nobody sees the creation of a digital strategy as their job, so if you don’t step up, then the chances are nobody will. Don’t wait to be picked either. It is not uncommon for senior management to ignore the need for a digital strategy. Even when they do recognise the need there is no guarantee they will turn to you for it.